A definitive guide to life from Australia’s most popular and terrifying newsreader, fashion icon and beer connoisseur. 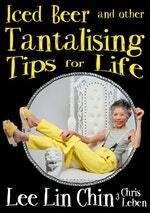 Lee Lin Chin - fashionista, newsreader, Gold Logie loser, social media superstar and Prime Chinister of Australia - has finally deigned to write an advice book. Here she shares her views on all the important topics, from acceptable careers (bartender; brewer) to her favourite cocktail recipe (beer, preferably obscure Japanese, served on ice). Written with Lee Lin’s inimitable flair and contempt for all beneath her, this book will give you the Chinspiration you need to live a transcendent life. Lee Lin Chin’s guide to real estate. The biggest titles for the littlest room in the house. Love Iced Beer and Other Tantalising Tips for Life? Subscribe to Read More to find out about similar books.